Greetings friends and fellow crafters. LeeAnn here today with the Sparkle Blends Blog Hop. I was so happy when Amber invited me to participate. I love making shaker cards, so of course I said yes. I used triangle stitched rectangle dies from my stash and the Birthday Bash Sparkle Blends that is part of the April Release for the shaker elements. Grand Prize: One lucky commenter who comments on all participating blogs in the hop will receive full sized packages of all 8 blends in the April release! Second Prize: One lucky commenter who comments on all participating blogs in the hop will receive a Birthday Themed prize pack, including a full sized package of Birthday Bash! Individual Blog Prizes: On each leg of the hop, I have asked the designers to choose their favorite blend from this release. Those blends will be given away to one lucky commenter on each of their hop blog posts! You must be at least 18 to enter, and reside in the USA or Canada to be eligible to win. Grand Prize Entries must be made through the corresponding Rafflecopter widget, and entrants must comment on all participating blogs to be eligible to win. Individual Blog Winners will be chosen from the comments within the corresponding blog only. Winners will be posted on the Doodles Paper Playground blog and will be notified by email. Winners will have 3 days to provide their address in order to claim their prize. Unclaimed prizes will be redrawn after 3 days, and will go to new winners. No exceptions. This giveaway is not sponsored, affiliated or associated with any other entity and is sponsored solely by Doodles Paper Playground. 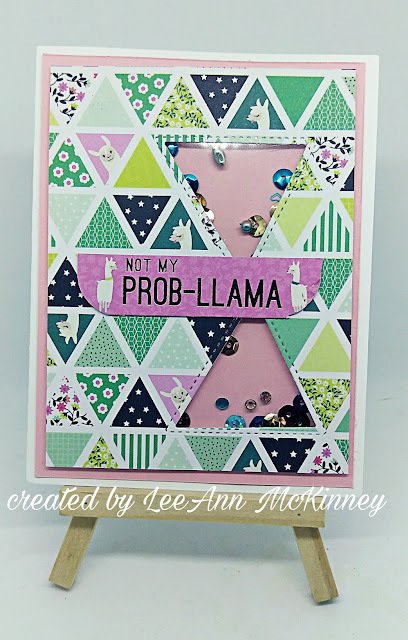 Love the shapes and llama! Thank you, I really did have fun with it. That llama paper is too fun!! Great card! Thank you, and yes I agree.. It was a "had to have" paper pad. Thank you Dawn, yes I love it too. Had to have it. Thank you so much Karen, that means a lot. Love the card, the colors are amazing! Congratulations, Kirsty Vittetoe! You are the winner of a pack of Birthday Bash Sparkle Blends for this leg of the hop! Please email doodlespaperplayground@gmail.com within 3 days to claim your prize! Thank you! Super cute and fun card! Love how you repeated the diamond shape in the patterned paper in your shaker frames. That is so cool with the Llama paper and that cute sentiment. A great shaker design. Thank you Joan, i really appreciate it. Wow I love those triangle stitched dies and that dsp. Beautiful. This makes for a wonderful shaker card. The Birthday Bash sparkle blend looks awesome picking through those little triangles. The llamas are sweet too. Thanks for sharing and insiring. I wouldn't have thought to use triangles for my cutouts but it's perfect. Thank you so much, I was sitting and thinking and it hit me, any other shape I think would have looked funny. Gorgeous paper and shaker combo on this unique card. Thanks for sharing your creativity. Thank you so much, it was fun. Thank you Cheryl, for sure loving on the Llama's these days. Awesome shaker card! I love the fun paper you used and the cute sentiment! Thank you Denise, I do appreciate it. Cute sentiment and paper and love the triangle shakers.